It’s been almost seven years since Rose Dougall’s first album Without Why. It was an inspired debut that balanced melancholy with direct Rock Pop. Sadly, it remained a hidden gem, lauded by a select few critics. A few weeks ago, Rose’s new album Stellular came in to the Records Sales Chart as a new entry at number one; knocking off none other than The Rolling Stones off the top spot and beating fellow new entry Brian Eno for good measure. This album has garnered more attention and has been featured more widely in the press which is no more than she deserves. Of course the proof lies in the music and her Future Vanishes EP in 2013 suggested a vibrant change of style was on the horizon. Has it came to pass? That shift in style is strongly felt with the lead singamd title track ‘Stellular’. It has that very keen sense of rhythm, but channeled through an Eighties Indie Pop track. Cascading synths take us from the verse to the chorus where Rose’s wistful vocals focus the buoyant sounds around her. It is a shifting and jiving piece of Pop music and as always it’s done with imagination with lyrics of emotional fragility Sifted through the guise of astronomy. It is an unrelenting track that leaves an indelible mark in your mind. ‘Strange Warnings’starts with a calm, Indie riff under a psychedelic disguise that then is suddenly yet all so easily pulled under a bass line that maintains a solid and arresting tune. The simple percussion also has the urgency of the rhythm being created. Rose joins in with her more haunting vocals as the steady build up of sound continues with the synths latching on too. It is a pure feast of groove and rhythm for which producer Boxed In deserves praise too. ‘Poison Ivy’ has a breezy and wistful flow to it from which melodic riffs peer through. Built on what are her easy and sweeping vocals, hidden behind all this are the sustained and complex percussion that maintains a steady rhythmic beat throughout the song and gives it a greater sense of depth and texture. The themes of jealousy, possession and power are projected out by the soothing vocals that are tinged with darker undercurrents in a smart contradiction to the ears. ‘Take Yourself With You’ carries on the air of the Future Vanishes tracks, with the slack, sweeping production and the indelible melodies. This track has these themes wrapped around a bright and breezy pop swoon with the loose riffs and chiming synths, tinged with an aged warping sound. Wistful harmonies back up Rose’s calm vocals from which she occasionally explores some higher tones as she sings about reinventing yourself. ‘Closer’ is a punchy and slick piece of Pop that has elements of the Human League to it its sound and lyrical style. Each steady stab of the bass line is tinged ringing riffs at the end of each line. It’s a another track bursting with rhythm and hooks. ‘All at Once’ is an alluring electro-pop track made so with smooth, rolling instrumentation and Rose’s hushed tones.’Colour of Water’ has a light neo-psychedelic feel to it whilst ‘Hell and Back’ has relaxed elements of her earliest solo work. For the most part, Rose has fulfilled her ambitions with this album as it is vibrant, infectious and dynamic. Her complex and multi-layered narratives make every track an intriguing one, but perhaps there were a few towards the end of the album that didn’t need to be there. They were breezy and subtle tracks, but they don’t necessarily add to the Pop and energises core of the album. Nevertheless, it’s been well worth the wait and Stellular justifies the Popular and critical acclaim it’s received. Just over a year after the release of one of the finest EP’s of the 2013 with Future Vanishes Rose Elinor Dougall returns with the track ‘Take Yourself With You’; an album track from her ‘soon to come’ second studio album entitled STELLULAR which is likely to be unveiled around five years after her Without Why debut in 2010. The track carries on the air of the Future Vanishes tracks, with the slack, sweeping production and the indelible melodies. This track has these themes wrapped around a bright and breezy pop swoon with the loose riffs and chiming synths, tinged with an aged warping sound. Wistful harmonies back up Rose’s calm vocals from which she occasionally explores some higher tones. She revealed to the Quietus that the lyrics are about “learning to accept to exist within that might be a way to be truly liberated instead of running away” and trying to reinvent yourself. Unlike the irremovable catchiness and infectious groove and rhythms of ‘Strange Warnings’ or ‘Future Vanishes’ this track is a more light and relaxed affair; more reflective. It suggests early on that the album will have a sense of depth a scale to it; an album she worked on with Oli Bayston as she did with last years EP. From that evidence and this simple, yet easy track it looks like STELLULAR is something to look forward to. 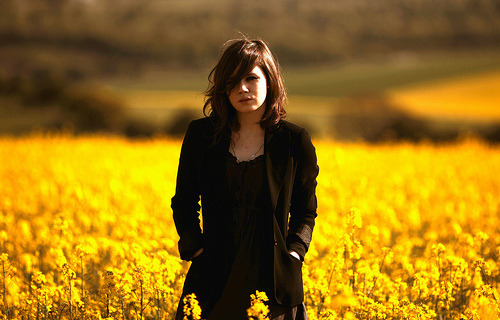 Last Autumn Rose Elinor Dougall released her EP Future Vanishes as a sign of things to come with her future direction. Not only was it my favourite EP of the year but the title track my favourite single. It has melodies and hook at every turn, it has a magnificent atmospheric quality to it, imaginative in it’s forms and lyrics and innovative in terms of combining pop and electronic features to a psychedelic track. On top of all this is it’s beautiful contradiction of its self. It can send you into an atmospheric and psychedelic trip into the depths of your thoughts or can leave you at the mercy of it’s rhythm and deep rooted groove. It does everything you ask for. A wondrous track. In an odd sort of way; I owe much of my taste in music to Rose. For years I was wrapped up in the 60’s through to the 90’s and that alone. Discovering her music made me realise that you could still find that creativity today. Her debut album: Without Why came into fruition because of that creativity. It featured simple elements of Folk, Psychedelic, Pop and proper Indie music and displayed them in such an eloquent fashion with a rich, soulful and haunting vocal all rolled into one to channel her personal and considered lyrics through it. Naturally the album had lots of depth and scale to it as well and she made a record far better than most British acts on a hell of a lot less money and demands. But that work was finalised in 2010. Last week she unveiled a new track called ‘Strange Warnings’ which is from her new album. I read about a year ago that there was a desire to put a lot of features from her time working with an amazing set of musicians alongside Mark Ronson into her second album which seemed like an interesting idea if not one I was unsure about too. However if ‘Strange Warnings’ is anything to go by; then she has made an exciting step up from Without Why which as I alluded to, was packed full of creativity. It starts with a calm, Indie riff under a psychedelic disguise that then is suddenly yet all so easily pulled under a bass line that maintains a solid and damn catchy tune and simple percussion that has the urgency of the rhythm being created. Rose joins in with her more haunting vocal but matched to the rhythm and groove of the instrumentals for a great combination. The steady build up of sound continues as the synths latch on too and it really whips up an anticipation that can’t be created when you go in all guns blazing, one second into the track plus there are even more varied percussion elements to keep this going and going. The groove delight and the rhythm feast have an easy melody to it as well as Rose’s vocals add a sense of calm balance to the music going on around her. The effects to her vocals are only subtle and don’t kill off her wholesome voice nor the music and she largely doesn’t need any to make her voice stand out as it has the ability to sit above it while still sort of blend in to the wave of sound that those like Kevin Parker can pull off so well. The lyrics are at least just as good as those from Without Why which she explained to The Quietus that “it deals with the idea of trying to find something to grab hold of when everything feel intangible and confused, amongst other things.” They were worked on with Oli Bayston who she also talks very highly of. All in all ‘Strange Warnings’ has really got me excited for the rest of the album which looks to be a rhythmic and groove fairing venture. There was sort of a feel of some people who have been like ‘where on earth have you gone?’ But if her next album is anything like this then it will be well worth the wait.